Matilda is one of the shows we were really looking forward to seeing in this season's Broadway package. 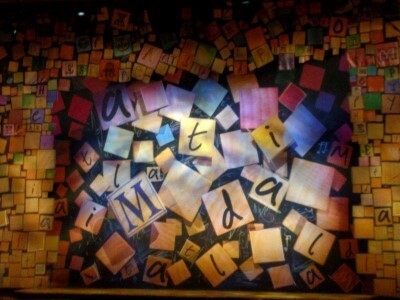 The show did not disappoint. It was excellent. As usual, we went to dinner after the show. This time, we chose Sienna on the Square. It's one of my favorite restaurants in Pittsburgh and I wish we got there more often. We were seated inside, not outside, and I was a wee bit sad because it was such a beautiful day, but then again, I really like the dark, cozy interior with the exposed brick wall. We each ordered wine to sip while we made our food selections: a glass of sauvignon blanc (Markham, Napa) for SP; a glass of pinot blanc (Michel, Fonne, Alsace, France) for me. Both were light & refreshing, perfect on a warm day. 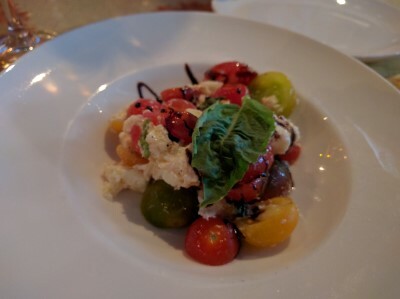 We shared the Heirloom Tomato starter (basil, mozzarella, extra virgin olive oil, reduced balsamic). One of my favorite dishes in the world is heirloom tomatoes with fresh cheese, balsamic, & basil. As always, this was delicious. 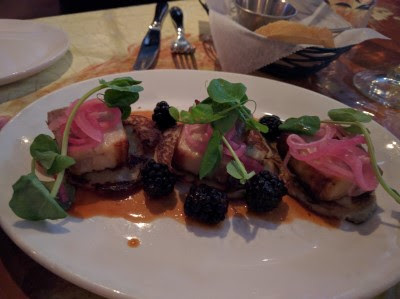 Equally delicious was the Braised Pork Belly (truffled potato pancake, pickled red onion, blackberry, pea shoots, reduced jus). The pork belly was so tender and had just enough fat. The potato pancake was excellent. This might be my new favorite appetizer ever. 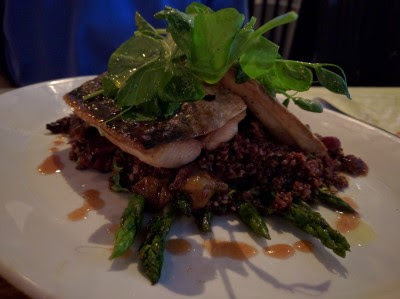 As usual, SP chose fish for his entree: Mackerel (asparagus, quinoa, roasted grapes). It was either that good or he was that hungry because he polished the entire plate off rather quickly and started eyeing my plate! He really liked the roasted grape flavor. 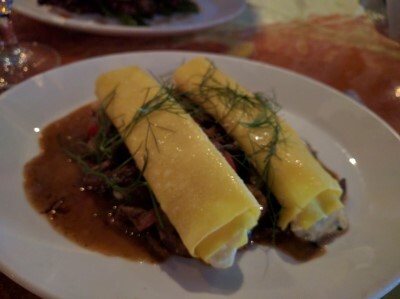 Unsurprisingly, I chose a pasta dish: Three Cheese Cannelloni (short rib, ricotta, parsnip, celery root, radish, pan jus). I've had the short rib from Sienna before, but in the past it was served with orzo mac & cheese. Both preparations are delicious and I cannot choose one over the other. I don't recall the short rib having beans in it before like it did this time, but they were easy to pick out and with SP already eyeing my plate, they, too, were eaten. Everything on the plate vanished. So. Tasty. All 3 desserts sounded good: Raspberry Tiramisu, Cannoli, and Lemon Pound Cake with strawberries. 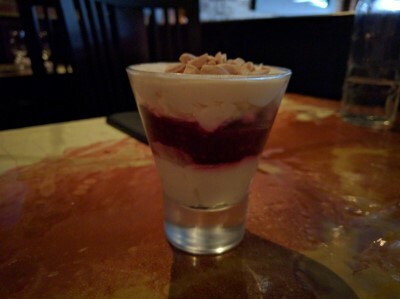 We chose to share the Raspberry Tiramisu at the restaurant and we brought home an order of Cannoli. The tiramisu was light, tasty, and just the right size for us to share after all the other food we ate. 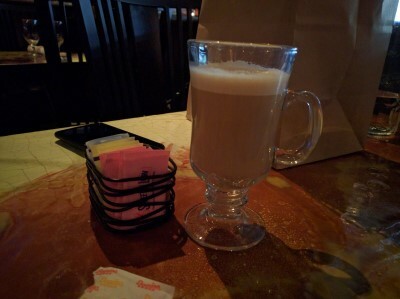 We also each had a cappuccino with dessert. We still think Sienna on the Square is terrific. Our server was friendly, checked on garlic for me. Other employees were equally friendly and helpful, making sure we could maneuver the wheelchair out easily. And the food was delicious. Still one of our favorite places.